It’s a ten out of ten for effort, but a two out of ten for achievement. “Engage your core, push and pull,” my guide Jay yells at me as I dunk my paddle into the murky water. Oh good, I’m travelling in circles. Again. 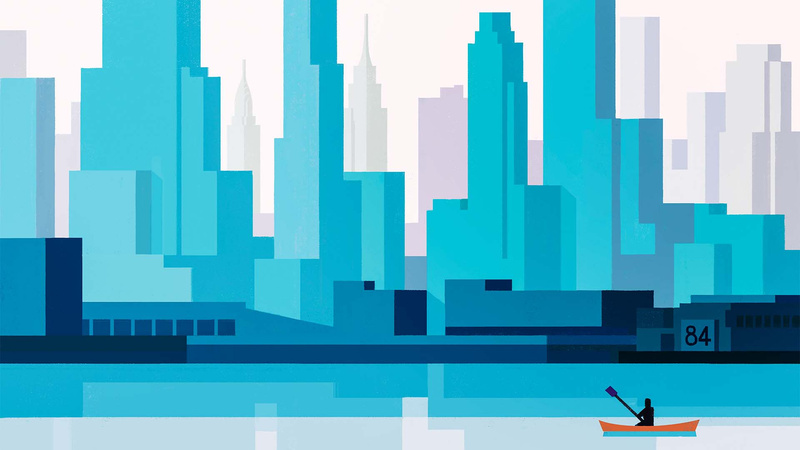 Shouldn’t admiring skyscrapers from a kayak on New York City’s Hudson River be easy? Past kayaking expeditions have been a doddle – skimming the sun-glazed Kefalonian coastline, exploring a bioluminescent bay in Puerto Rico, hurtling down grade five rapids in Oz. This isn’t a kayaking brag list; if such a thing exists. The point is, I always got from A to B. Today I’m aimlessly floating along a 315-mile-long body of water that wraps its way around the west of Manhattan, New York, towards the Atlantic Ocean. I have no power, no direction and no speed. And the most crucial thing, perhaps: no boyfriend. It turns out my absent other half really has been doing all the hard graft when taking up the rear-seat responsibilities on all of our past kayaking trips. At least I’m eager. Forget the Empire State Building, Central Park and the Statue of Liberty – I’ve been there, done them. On this visit to NYC I’m after an alternative, less obvious perspective on the famous Manhattan skyline; one that doesn’t include queues, heights or endless throngs of tourists. But before you even contemplate a jaunt along the Hudson and a faceful of water, you need some theory. And that starts with your guide. I wait at the boathouse of Pier 84 – a wooden structure that touches the traffic-clogged First Avenue and 42nd Street of Hell’s Kitchen on one side, and the treacle-coloured Hudson on the other. Jay, director of paddling at Manhattan Kayaks, soon slides up on a skateboard, which should give you some idea of his vibe – enthusiastic, chilled and fun. The perfect teacher for the imperfect student. Jay leads me into the tin-roofed boathouse – essentially Jay’s giant toy box, full of luminous life jackets, skittle-hued kayaks and unforgiving wetsuits. The first thing to remember when you’re receiving a crash course in city kayaking is never to offend your teacher. Don’t say things like “Canoes and kayaks: same thing, right?” (cue pained look from Jay). Although they both float on water and require paddling, a sea kayak is a streamlined stealth machine, all speed, agility and maneuverability. Likening it to a cumbersome canoe is a watersports faux pas, the equivalent to comparing an Aston Martin to a Vauxhall Astra. James Bond, like Jay, would not be impressed. As we wander around the giant shed, Jay introduces me to my gear – wetsuit, spray deck (a tutu-type thing that attaches to the kayak), life jacket, windbreaker and some thick socks he likes to call ‘booties’. I’m neoprened to the eyeballs in a colourful ensemble that’s impossibly tight. Of course, this is a summer activity best served warm to hot, but to bring you the lowdown for the start of spring, I’m trialling it in a choppy freezing river – hence the get-up. As I clamber into my kayak (it’s been dragged onto the scratchy carpet of the boathouse – no Hudson for me yet), Jay starts talking me through the skills required to successfully navigate this vast stretch of water. “Amateurs will drift to god-knows-where in this river,” he warns me. Contrary to how it looks, kayaking is not an arm-intensive sport, so if your biceps feel the brunt, you’re doing it wrong. The technique is all about the core and it demands strength in your torso; rotate your trunk and don’t, whatever you do, bend your arms. All pretty simple stuff when you’re pretending to kayak on a grubby carpet. With the basics covered, Jay then sets about explaining the rescue process if my kayak should be hit by a giant rogue wave (rivers do have waves, it turns out) and I capsize. I panic just practising it. But, assuring me I’m ready, Jay drags our vessels out to a wobbly wooden pier and I pad my way across the snow to reach the lime-green, fibreglass float that will be taking me on a tour of Manhattan for the next 90 minutes. I lower myself in with a remarkable lack of faff and soon I’m off, drifting quickly towards Intrepid, a steel-grey, 250m-long decommissioned WW2 ship that’s moored at the next pier. It’s massive. I panic-paddle in its shadow. I needn’t worry. The Hudson, Jay explains, as we stroke our way to the middle of the water, is a tidal river that changes direction every six hours, meaning at certain times of day there’s a better, and safer, way to travel. Handily, there’s an app for that – and Jay’s checked it. With our backs to Manhattan, to our left we have the glittering skyscrapers of Wall Street, the Statue of Liberty and the Atlantic Ocean. Today we’re bearing right, gazing at the jagged outline of the high rises surrounding Central Park, a few ducks and a suspicious-looking log. Indeed. Times Square, Manhattan’s most chaotic site, is just five blocks away, yet on the water it’s so silent, so un-New York. Where’s the hassle, the horns, the hordes? Here on the Hudson it’s just me, Jay and a police boat that threatens to flip me with its boisterous backwash of waves. And I’m actually learning something. 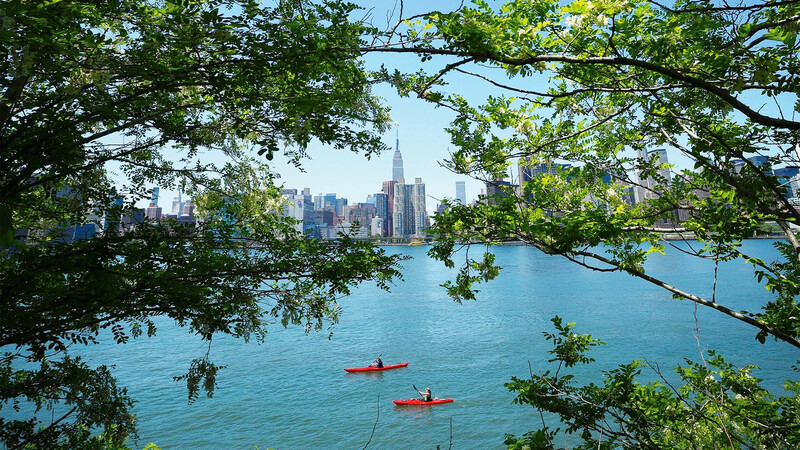 Not so much about kayaking – which I’m slowly getting the hang of – but about the city. My past visits to NYC have been a blur of burger hunts and bar crawls, but today Jay is pointing out buildings I never knew existed. There’s VIA 57West, designed by the Dutch architect Bjarke Ingels, who’s created an unconventional, modern pyramid-esque glass structure that homes some of New York’s wealthiest residents. His future projects, Jay explains, include the Dryline – a city flood barrier – and Two World Trade Centre, a structure that’ll soon be erected on the site of one of the Twin Towers. Behind it there are skyscrapers, dozens of clean lines and impossibly tall buildings that look even more vertiginous when you’re sitting inches from the water. 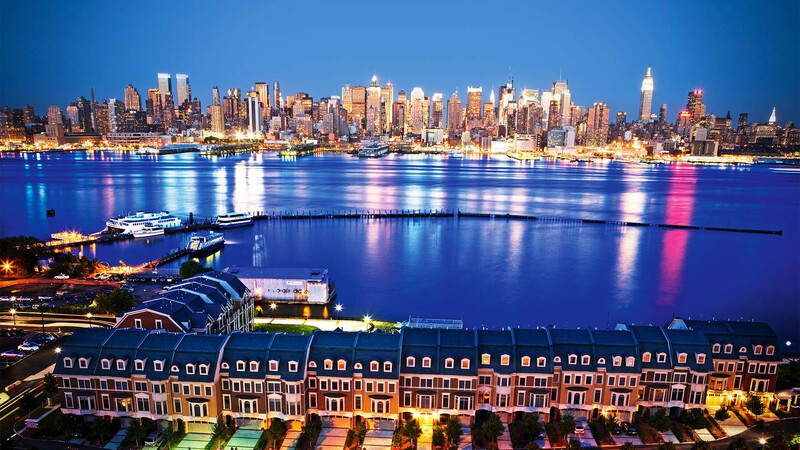 Then, on the other side of the Hudson, is New Jersey – the less fashionable American state that’s separated from the mania of New York by a mere 200m of moving water. Small houses line the river, a picture of fuss-free, slow-paced suburbia. They have one hell of a view. Paddling onwards – in no particular direction, I haven’t mastered steering yet – Jay takes the time to explain more about the river itself. Your natural inclination is to think a river in a big city is chock full of rubbish – falling in and contracting a horrific disease is my main concern, after drowning. Of course, I’m being paranoid. Thanks in part to the six-daily tidal flows, the Hudson is pretty clean; when I accidentally slap the paddle down and splash water in my face – it happens many times – it’s not a mouthful of sewage I’m drinking. Sure, it’s far from clear, but it’s not packed with junk, pollution and ‘rubbers’ either. Well, “Maybe a few,” Jay admits. In fact, way back in 1609 when Henry Hudson first sailed the river, he had to navigate his way around 200,000 acres of oyster reefs. The oysters’ cleaning abilities meant the water hosted thousands of species, making it one of the most diverse environments on earth. By 1906, though, greedy New Yorkers had scoffed all the molluscs, creating a river that was toxic and lifeless, and it remained so until the 1972 Clean River Act, which vowed to improve the water purity. It’s working well. Coupled with a successful clear-up effort known as the Billion Oyster Project, the Hudson is becoming even cleaner. By 2030, one billion live oysters will be distributed through the water, making the New York harbour one of the most productive bodies of water in the North Atlantic, and reclaiming the city’s title of oyster capital of the world. Oyster cages now line the shore, one of which is clinging to Pier 84, right where we’d set off. That’s all fascinating stuff, but 60 minutes in and I’m starting to wilt. My core’s given up, my biceps burn, and no matter how hard I try I just can’t go in a straight line. My introduction to the Manhattan skyline has been a 200m-wide circle stretching between Pier 84 and Pier 98. As we head back to the boathouse I realise that I’m suffering from what Jay calls the ‘treadmill effect’; the deadly combination of a novice kayaker in a strong tide. “It’s basically inefficient and exhausting paddling,” he tells me. Like I need reminding. 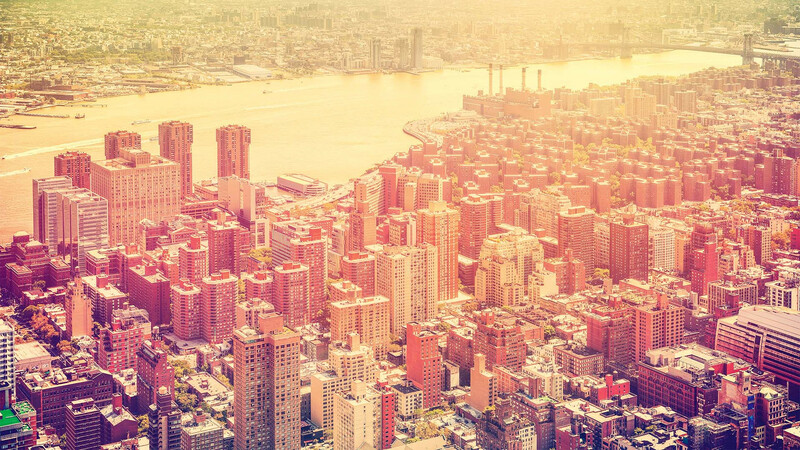 I thought I knew New York, but sitting five centimetres above the Hudson has made me appreciate the city in a whole new way. Back on shore, I head straight to the nearest burger joint to refuel. Some things never change. 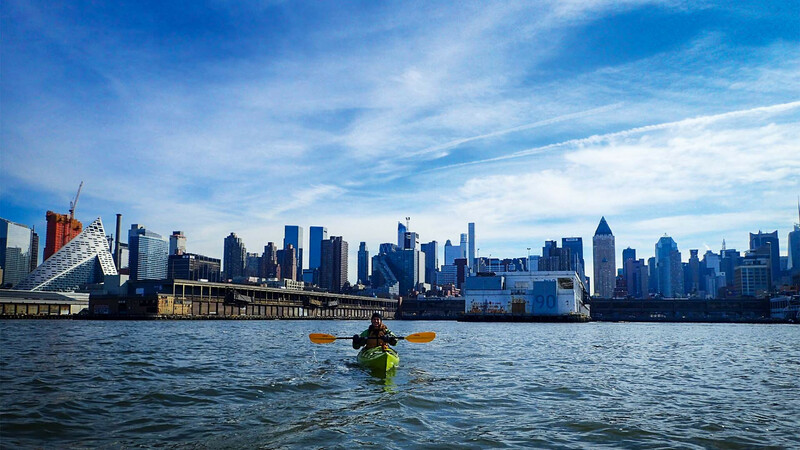 Manhattan Kayak Company offers kayaking sightseeing expeditions from £40 for one hour, visit manhattankayak.com for tour options and to book; Virgin Atlantic offers return flights from London to JFK from £410, virgin-atlantic.com; visit nycgo.com to explore more of New York.